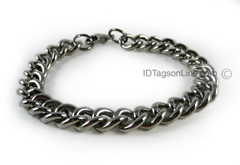 Stainless Steel chain Bracelet (.4 or 10 mm wide). This wide chain Bracelet , IDB49 (size .4" or 10 mm wide) is made from premium grade Stainless Steel, highly polished and featured with lobster clasp. It is sold without any plate.